Just want to share this. I have been a Whirlpool customer all of my life. 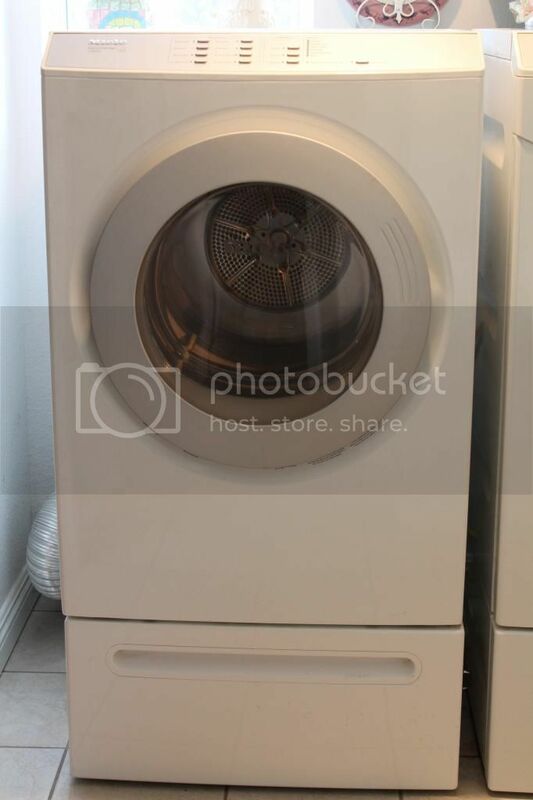 4 1/2 years ago, my washer and dryer was 20 years old, never had a problem, but the washer died. We decided to buy a new set. Went to Pacific Sales where we were shown the German Miele product. It was twice as expensive as all of the other brands. We were told that this product was amazing. "Built to last 20 years" we were told. All of the others were built to last 8 years. We spent the $3563.00 for the German set. Now, the set is 4 1/2 years old and the fan inside of the dryer disintegrated. It took Miele two days to get here to look at it. This cost me 125.00 for the visit and $80.00 per hour labor. I asked why the fan broke and was told because it probably had a coin or something got into it and tore it up. Impossible!!! So it is my fault? I think not. No coin. No foreign object in the fan. Wrong. And with these computerized units, you would think that the computer would be the problem, but no, a cheap plastic fan and housing. He replaced the fan and it is still broken. Now parts have to be ordered. I am on the west coast. Miele loves to sell to wealthy West Coast customers, but parts are warehoused on the East Coast. So now, I have to wait for them to be sent by UPS! Hello Miele! FedEx is faster...Now, it is racing season and Cory is traveling every week. He needs a working washer and dryer when he is home for a few days between events. I explained this to the repairman, that we need this thing to work and that a new appliance should not have defective parts at this point in time. He fiddled with it and said that it can be used but it will be loud until the part comes in. I was told that someone would be calling me to set an appointment. He said that the parts were ordered 2nd day air. Those parts should be here today. Tried using the thing last night. Sort of works, but not really. No one called me so I called them and was told that they have me scheduled 6 days from now to fix the thing. Isn't it customary to call a customer to see if they are going to be available BEFORE you schedule an appointment? Could not get a solid answer as to why it takes 6 days to get here to fix this thing with parts that should be there today. The repairman lives in my city, by the way. So, now we are stuck. Cory has to leave for a race and we can't wash clothes. Miele is in no hurry to fix their defective product. If you are shopping for a new washer and dryer, don't pay more for a German Miele. It is no better than the rest, offers no better customer service than anyone else. Just get a Whirlpool or a Kenmore on sale somewhere and call it good.